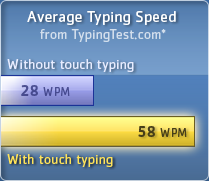 Touch typing does wonders to your typing speed - that's a fact. We recently had over 15,000 people take a combined typing test and survey at TypingTest.com. The results were indisputable: those who used touch typing were on average two times faster - the best even three or four times faster. Quite a difference! What's more, touch typists made less errors and didn't need to spend time on corrections. It really goes without saying - you will save a lot of time! Just think about it -- double the speed and no typos. Once learned, touch typing will keep saving you time day after day, year after year. Take a good look at your typing. 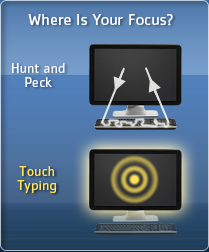 Notice how every time you peek at the keyboard or press a wrong key, your thoughts get distracted. It's time for a change! Touch typing will keep you focused. As your fingers know their way on the keyboard, they don't need your attention any more. Instead, you can fully concentrate on what's important - the text you are writing. Once you know touch typing you will be amazed how easy writing can feel - your thoughts simply fly to the screen! Do your arms and shoulders ache after a day at work? They deserve better! 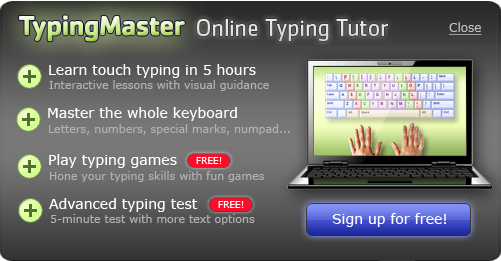 Touch typing enables you to type using just quick, light finger movements. Your arms rest still while ten fingers are swiftly tapping the keys. As a result your arms will relax, your shoulders won't rise and tense up any more. Also your neck will have it easier as you find the the right keys without looking down at the keyboard. Don't hold back! When your typing keeps up with your thinking, productivity is guaranteed to increase. Complete all computer tasks, such as emailing, reporting or data entry, much quicker than before. Make instant messaging a breeze by typing away replies in seconds. Take meeting notes at the pace of conversation, without staring at the computer. Speed, ease and efficiency - touch typing helps you get things done.